While rare earth permanent magnets are helpful in increasing the energy efficiency of a variety of technologies from motors to wind turbines, fission elements have the potential to reduce the need for these energy efficient technologies by augmenting world energy production. While nuclear power is not without its faults, 12.3% of world energy production comes from nuclear power plants currently, and there is potential for a much greater percentage of world power to come from nuclear sources. Safety is a major concern for the continued use of nuclear power. Although meltdowns are certainly catastrophic when they occur, the track record of nuclear power safety is actually very good, with less deaths per TWh produced than many other energy industries. To date, there have only been three major meltdowns, Chernobyl, Three Mile Island, and Fukushima, and only Chernobyl resulted in loss of life (World Nuclear Association, 2012). While it is certainly a worthy venture to improve the safety of nuclear reactors, this is already a major focus of governments and the public, and therefore will not be a focus of the Mission 2016 proposal. 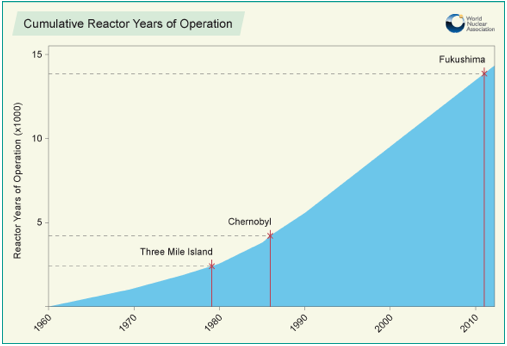 One of the major problems with modern fission reactors are the nuclear waste they produce. The U.S. Department of Energy (DOE) released an Engineering and Technology Roadmap (Roadmap), in 2008 which details initiatives aimed at addressing the problems of cleaning up Cold War era nuclear waste in the coming decade. To dispose of surplus wastes and protect against it from falling into the wrong hands, the US has plans to mix plutonium with uranium to make mixed oxide (MOX) fuel for power reactors. The implementation of a MOX fuel program will be used to eradicate weapons-grade plutonium left over from the Cold War. Although the US government currently plans to utilize MOX as a solution to nuclear waste, there is no subsequent reuse of MOX spent fuel planned. The fuel is now being disposed of in a waste repository along with other high level nuclear waste. However, The DOE explicitly states that commercial reprocessing of nuclear waste is currently not practiced in the United States. To date, no plant in the United States is reprocessing fuel. However, there are ways to use most of the uranium and reprocess nuclear waste. Recycling used nuclear fuel could produce hundreds of years of energy from just the uranium we've already mined (Argonne National Laboratory, 2012) . Politics and problems with older technology stopped recycling of nuclear fuel in the United States, but new advancements in the field have allowed other countries to take advantage of this wasted energy. As of 2005, more than 30 nuclear were using MOX fuel for energy in France, Germany, Belgium and Switzerland ("Energy secretary bodman," 2005). France is the most active country in developing nuclear energy technology with 75% of its total energy coming from nuclear power. 17% of their total power comes directly from recycled nuclear fuel. In order to address the problem of accumulating nuclear waste and increasing demand for energy, we must catch up to other countries and begin implementing reprocessing of spent fuel and MOX fuel to produce power. This is a huge source of energy currently going to waste and creating problems for nuclear energy as a whole as we try to find places to put it. The problem of radioactive waste from fission reactions is clearly a problem that needs to be solved. While safe storage options are important, it is even more important to reduce the amount of radioactive fission products to begin with. Thorium reactors could provide a way to do this. LFTRs are a type of molten salt reactors (MSRs). Research into flouride salt reactors began in the 1950's by the Oak Ridge National Laboratory. This research using liquid flouride and thorium had positive results, but was deemed inefficient by the military, the US Atomic Energy Comission was not interested and MSRs lost support as government funding was cut in the 70's (Nayer, Liu & Yang, 2012). The project was cancelled due to political pressures favoring investment of resources into other nuclear sources. However, many of the common concerns regarding nuclear power can be addressed through thorium based fission, specifically LFTRs. The salts in LFTRs are chemically stable, non radioactive and non-corrosive to their containers; there is no chance of meltdown like in modern uranium based fission reactors and LFTRs have a built in safety check; if the reactor overheats or the power goes out, a freeze plug of molten salts melts and the core salt drains safely away into a passively cooled tank. While a major issue with modern nuclear power production is that of accumulating nuclear waste, there would be less waste associated with thorium based fission because all of the thorium mined is in the isotopic form needed for the reactor. Uranium, on the other hand, must first be enriched, which leads to much of the waste produced in these types of reactors. Currently, only about five percent of the uranium in a fuel rod gets fissioned for energy; the rest is taken out as waste and put into permanent storage (LERNER, 2012). All of the thorium put into LFTRs is used. The products of LFTRs are less weaponizable than those in modern reactors and do not produce plutonium. Although the U-233 can in theory be used for nuclear weapons, a slew of engineering difficulties such as U-232 contamination are associated with extracting it from LFTRs specifically. Doing so is highly impractical and nearly impossible in these types of reactors (Nayer et al, 2012). Thorium is far more abundant in the Earth's crust than Uranium, and virtually all of it is the isotope Th-232 needed for LFTRs. With all of these advantages over Uranium based reactors, why are LFTRs not replacing this older technology? The main reason is cost. The most conservative estimates are in the range of hundreds of millions but will likely cost a few billion. Oak Ridge National Lab (ORNL) made several estimates of developmental costs for thorium molten salt reactors, one of the last ones translating $2.5 billion 2008 dollars. In 1972, the AEC WASH-1222 report estimated MSR development cost to be $2 billion, about ten billion 2009 dollars. However, there is no suggestion as to how the AEC arrived at this figure (Barton, 2009). The Obama administration has cancelled the expansion of Yucca mountain for nuclear waste, making it impossible to keep expanding our current nuclear technologies without new ways to dispose of or recycle waste. Thorium based fission reactors, especially LFTRs provide a promising solution to reduce waste, but political factors and extremely high costs have slowed their development and implementation on a large scale. Governments and companies are beginning to invest resources into finding an economically feasible way to do it. Despite United States interest, the rest of the world is ahead of the United States in terms of researching and developing new Thorium technologies. India has about one fourth of the world's Thorium yet has very little Uranium. This has motivate the country to state it will meet 30% of its energy demands using Thorium based technology (other than LFTRs) by the year 2050 (Katusa, 2012). A 500-megawatts electric prototype breeder reactor should be completed this year in India, while six more of these breeder reactors will be constructed there in the next decade, which breed U233 and plutonium from thorium and uranium (Katusa, 2012). India is currently testing a full scale reactor fueled primarily by thorium, which they project to generate 300 MW of electricity by the end of this decade (Martin, 2009). Current projects are also being undertaken extensively in China and other countries to further develop LFTRs (Katusa, 2012). There are only a few companies actively pursuing the commercialization of technology to use thorium and LFTRs as a replacement for Uranium in modern nuclear reactors. The US company Lightbright has started to develop a stronger business model and is starting to produce enough revenue to commercialize the LFTR reactor technology (Martin, 2009). In 2009, Lightbright was able to sign a deal to investigate alternative fuel assemblies with Areva, a French firm who is currently the world's largest nuclear power producer. Lightbright also currently has a multimillion dollar contracts in the United Arab Emirates to advise on new plans for nuclear power (Martin, 2009). Thorium based LFTRs showed promise decades ago but were forgotten due to political and economic reasons. Its time to seriously pursue the development and implementation of LFTRs if we hope to move towards a peaceful, energy-independent and clean future accessible to all countries, developed and developing. Even though the US government may not be currently funding thorium based reactors, it can take steps to ensure it remains viable in the future. Firtsly, the government needs to keep its U-233. It is estimated that about one tonne U-233 is needed to initially start the fission in an LFTR, which, once started, can continue indefinitely with only the addition of more thorium. However, the DOE currently has plans to dispose of the US stock of U-233. The effort aims to process the high-hazard nuclear materials to eliminate the weapons potential of the uranium stored at ORNL and dispose of it at the government's Nevada National Security Site. This plan is estimated to cost $511 million (Oak Ridge Site Specific Advisory Board, 2012). The US may want to reconsider this and possibly put these hundreds of millions into development of thorium based fission reactors and MSRs, which can use this U-233 to create power as long as we put more thorium into the reactors. The fact that thorium is abundant in many developed and developing countries means once the technology for LFTRs is established, most countries will at least have the thorium to power them with less fear that their by-products will be used for nuclear weapons. Once the initial costs of research and development are done, the use of LFTRs will be cheap, effective and safe. We must change energy policies in order to let thorium work. Thorium isn't dangerous to work with, handle or store and we must pass legislation to say this. The Thorium Energy Independence and Security Act of 2008 proposed by Harry Reid called to establish offices at the NRC and the DOE to regulate and promote domestic thorium nuclear power generation and oversee possible demonstrations of thorium nuclear fuel assemblies (110th Congress, 2008).The bill also called for $250 billion from 2009 to 2013 to accomplish the development of Thorium based fission and to carry out the proposals in the bill. However, the bill has not been passed but shows the direction our legislation would need to take if we want to achieve thorium based fission in the near future. Renewable energies such as wind and solar are less efficient at producing energy than nuclear. They rely on rare earth elements such as neodymium and other elements which are mined mostly by China in often environmentally unfriendly ways. However, when mining heavy REEs anywhere, a large amount of thorium is present in the mined material that is currently not being used. In fact, extraction of REEs from monazite is not viable because of the cost involved in the disposal of thorium and uranium present. Thousands of tons of thorium have already been dug up in the mining of heavy REEs and are just sitting around and can even prevent the use of the REEs. If a viable method of thorium based fission is established, there is plenty of thorium to feed it. Fusion can be thought of as the opposite of fission. In fusion, two atoms of hydrogen combine together, or fuse, to form an atom of helium. In the process some of the mass of the hydrogen is converted into a vast amount of energy. Fusion releases even more energy than fission and would solve our energy needs if developed. However, at this time fusion is just too difficult and currently consumes more energy than it produces. It is not be feasible in the near future with our current technologies. With years of more research and development, fusion may provide a clean, renewable, waste free solution to our energy needs in the distant future, hopefully within the coming century.